Stable filter recovers signal in impulsive environment. 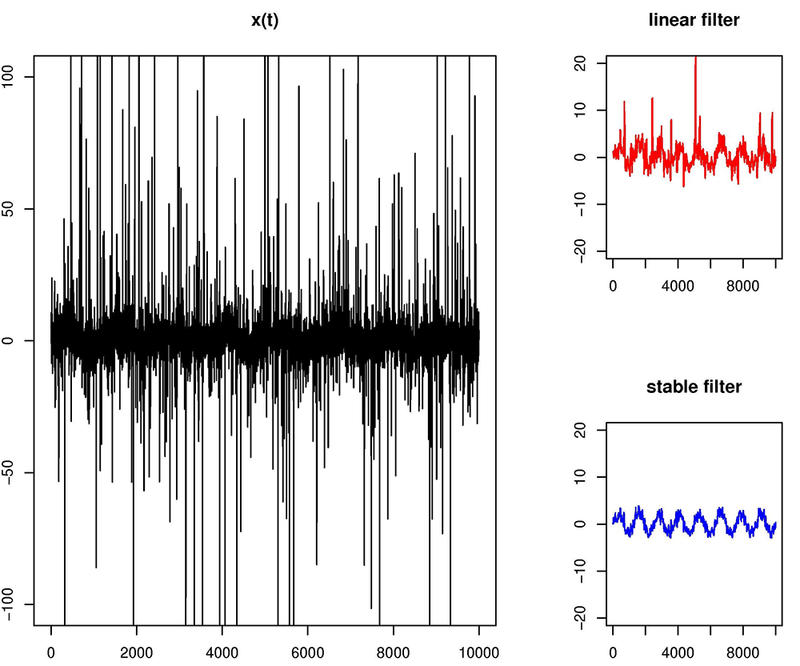 The program STABLE provides a toolbox for working with stable distributions in MATLAB. Stable distributions are a class of probability distributions with heavy tails and possible skewness that are used in signal processing, image processing, finance and data modeling. STABLE provides callable routines for computing stable distribution densities, cumulatives, and quantiles, as well as simulating and estimating stable parameters from data. There are 120+ functions, including multiple regression, multivariate stable laws, and nonlinear signal processing filters for impulsive noise environments. Typical users are engineers seeking to better model data with heavy tails. STABLE is supplied as a DLL, with mex routines to access the various functions. For example, stablepdf(x,...) computes a stable density at the values in x. Basic help is built-in, and a user manual provides more information.